More than 1,500 live turtles were found in four unclaimed suitcases at an airport. 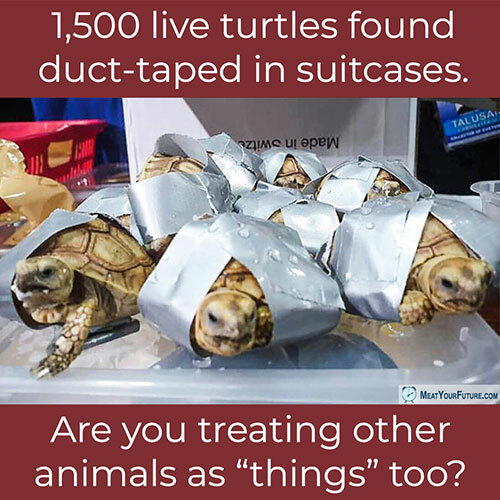 Apparently, the person who smuggled them became aware that he could face jail time and fines if discovered, so he abandoned the luggage with the turtles. His act of taking thousands of turtles, wrapping them in duct tape, and stuffing them in luggage on a long flight is outrageous and cruel. But, in reality, it’s no different from the attitude most people still have towards animals. We treat other animals as mere “things” to exploit and use for our most trivial of purposes. We use them for their skin, their fur, their feathers, their meat, their milk and their eggs. We think insects are here to crush for color dyes, and that it’s okay to force-breed billions of living beings into existence to enslave and kill for foods no one needs. Lest we forget, we too are animals, and are actually a very recent addition to this planet (having been around for only around 200,000 years). Other animals have been here for millions of years before we existed, and they are not here to serve us. Yet we insist on institutionally exploiting them by the trillions for the most trivial of purposes, while causing unimaginable terror, cruelty and death in the process. Please consider seriously the moral obligation we have to not treat other sentient beings as “things” and go vegan.